Did you have a great Christmas? We did, full of family, friends and lots of food. And I do mean lots of food. It seems that the kids and I just finished eating most of our Thanksgiving leftovers when it was already time for Christmas leftovers to start. Needless to say, there is a lot of turkey and ham once again, and of course, my favorite, leftover Christmas cookies. But since Christmas leftovers are similar to Thanksgiving ones, we are definitely looking for new ways to repurpose them! Looking for a new approach for all that leftover Thanksgiving turkey? 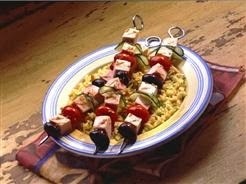 Create Greek Turkey Kabobs by cutting Jennie-O® Turkey Store® oven roasted turkey breast into cubes and alternately threading them onto skewers with cucumbers, tomatoes and Peloponnese® kalamata pitted olives. This Mediterranean twist might just convert reluctant turkey eaters! Use extra holiday ham and pie crusts to bake a delicious quiche! 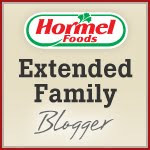 Mix in your favorite vegetables and seasonings with Hormel® Cure 81® sliced ham to create a wonderful meal that can feed the whole family. If you’re craving the standard leftover turkey sandwich, take it up a notch with corn tortillas! They make a great stand-in for bread and give your sandwich an extra special crunch. Make a lunchtime salad by tossing pasta with leftover turkey or ham, vegetables, and your favorite dressing. What are your favorite ways to repurpose holiday foods into new meals?